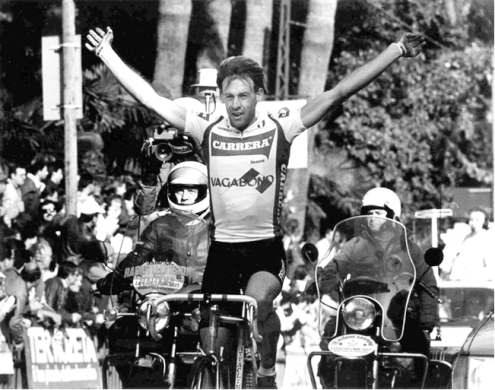 Aggressive racing and bold moves perfectly described the 1987 Milan-San Remo. Relatively unknown Swiss rider Erich Maechler surprised the favorites with a bold move late in the race. Unusual good spring weather at the start in Milan sent the 273 rider peloton out across the plains of Lombardia. After the sprinters collected their premes, offered by the small villages along the early race route, a nine rider group broke from the peloton. The breakaway of relatively unknown riders gain 1’15” over the summit of the Turchino Pass. The favorites of the race allowed the group to gain 11 minutes in Savone, 100 km from San Remo. The peloton began to chase and the time gap tumbled. By the Capo Berta with 40 km to go the lead had come down to 2’45”. Aussie Alan Peiper and Swiss Erich Maechler attacked and dropped their breakaway companions. 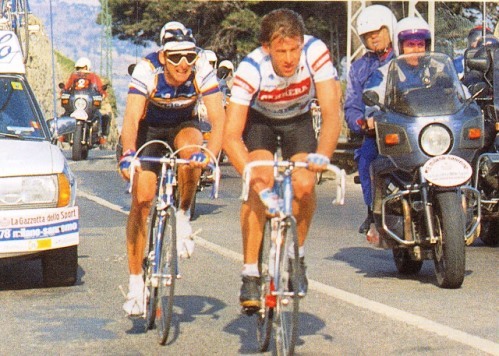 The two held a slim 25 second lead at the foot of the famous Poggio with Phil Anderson driving the furious chase. Quickly Maechler initiated the decisive attack move of the race leaving a struggling Anderson behind. Eric Vanderaerden crested the climb and plunged down the Poggio. Maechler enter the finishing straight on the Via Roma to a huge ovation with Vanderaerden closing quickly. Little known Carrera rider Erich Maechler stood up and crossed the finish line six second ahead of Vanderaerden. 1. Erich MAECHLER (Sui) 7h00'52"
2. Eric Vanderaerden (Bel) +6"
3. Guido Bontempi (Ita) +8"